Conner's Cubbies is much more than a simple gymnastics program. Our classes are held in both the big gym and in a separate room, specially decorated for little gymnasts, which allows students to pay attention better and learn quicker. A full line of colorful, pint-size equipment is used, including a variety of mats of all shapes and sizes. You must see it to believe it! We feel that every child should have the opportunity to explore a wide variety of movement concepts and skills in a safe and positive learning environment. Each lesson is geared toward developing the child's self-esteem and confidence. 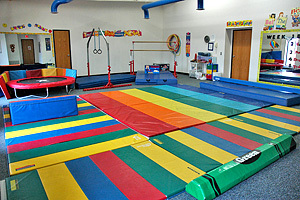 The lessons build over the weeks as the children learn rolls, jumps, balancing, stretching and other motor activities. Special theme classes, such as Halloween week or Beach Week, add to the fun. Parents are allowed to stay in the room and watch the class, which meets once a week for 45 minutes. As a courtesy, please reserve evening and Saturday morning classes for families who cannot attend daytime classes. Thank you! Children learn to move and move to learn! What are some of the benefits of movement education for young children? Gymnastics helps with physical, social, emotional and cognitive development. At Bart Conner Gymnastics Academy, we utilize games, gymnastics skills, equipment, the trampoline and dancing to challenge children and foster their physical and mental development. Movement benefits the whole child and it promotes fitness, self-esteem, self-confidence and learning. Muscle skill development helps maintain a healthy body, while the mental development builds the brain for future success in reading, writing and math. All children need to move to be healthy—physically, mentally and emotionally. Cars, demands on time, television and computers mean people are much less active than they need to be. Children are growing up with limited time and opportunities to move freely through their streets and neighborhoods. Movement is instinctive, natural and most of all beneficial. Get your child moving today at Bart Conner Gymnastics Academy!